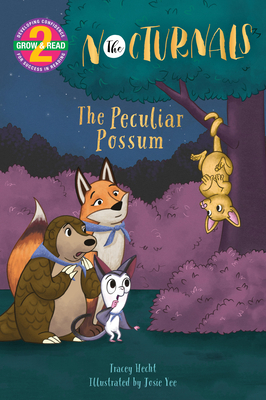 In The Peculiar Possum, Tobin, a sweet pangolin, Bismark, a loud-mouthed sugar glider, and Dawn, a serious fox, encounter strange sounds and smells in the valley. When an unfamiliar animal appears, Bismark is not pleased But soon Bismark and the Brigade learn that being peculiar is also reason to be proud. Tracey Hecht has written, directed, and produced for film. The American Booksellers Association chose the first book in her critically acclaimed middle grade series, The Nocturnals: The Mysterious Abductions, as a Kids' Indie Next List pick. Last year, she expanded the series to include early reader books, The Peculiar Possum and The Slithery Shakedown, so that families could share the reading experience together. In partnership with the New York Public Library, Tracey created a Read Aloud Writing Program that she has since conducted--both in person and virtually--in over eighty-five schools, libraries, and bookstores across the country. Tracey currently splits her time between New York City and Oquossoc, Maine, with her husband, four children, and dog, Penny. Josie Yee is an award winning illustrator specializing in children's books. She lives in New York City with her daughter, Ana, and their cat, Dude.